Zed wrote: I hope we are getting closer to the truth, I have a feeling it won't be coming from the camera of "Mark Hawkins" or his enchanted woods. 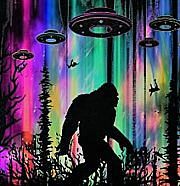 As far as Bigfoot/Yowies are concerned progress towards the truth is going to be ponderous basically because of the indifference or denials by governments, authorities, scientists and probably more than half the human population. We are, however, forgetting about that other 'elephant in the room' or should I say 'dog in the room'- Dogman. This is one little cryptid people cannot get their head around and don't want to at least here in Australia the US is different. So I suspect when the truth is revealed it's not going to be what everyone expected. Dogman is going to be a hard pitch to sell unfortunately. Even on open minded forums like this, its hard to get your head around. I agree ChrisV that Dogman is going to be a hard pitch to sell but only in Australia. The US has many, many reports and sightings of Dogman with chanels devoted just to the Dogman phenomena. People like Linda Godfrey, a newspaper reporter and journalist have been following and reporting for years; I have seen her interviewed on shows like Monsters & Mysteries in America. Example below. Researcher, author and newspaper reporter, Linda Godfrey, while interviewed on Coast to Coast AM, said she has been tracking upright, canine creatures that look like traditional werewolves for over twenty years. Recently she was on the show to discuss modern and classic sightings of the creatures. Descriptions by witnesses of the Manwolf or Dogman have remained consistent over the years and across the US– a 5-7 ft. tall creature that stands, its hind legs (although it can alternate between that and all fours), is covered with shaggy fur, and has a long snout, fangs, and pointed ears on top of its head, she detailed. Curiously, people often note that it has a jeering or sneering quality as though it’s trying to scare them. Godfrey has studied various tracks left by the creatures– they tend to be around 6 inches in diameter and have certain differences from regular dog or wolf tracks, she said. Sightings date back millennia, and across cultures (the Romans even had a holiday called Lupercalia related to wolf lore). She recounted an intriguing case from 1936 when a night watchman saw an upright 7 ft. tall canine-type creature near an Indian burial mound that growled in a “proto-human voice” a word that sounded like “Gadara,” a place mentioned in the Bible where Jesus was said to cast out demons. Locations where the dogmen are seen are almost always near water sources, and tend to be places like cemeteries, church yards, crossroads, highways, and remote military installations, she said, adding that in some hotspots, Bigfoot, UFOs and other anomalies are also reported. Interestingly, she found a correlation between sites of ancient Indian animal-shaped effigy mounds in southern Wisconsin, and dogman sightings. Godfrey noted there is some anecdotal evidence that through magical rites or mental projection, people may be able to manifest as these creatures. She also shared her own recent odd encounter which took place last month in the Kettle Moraine area of Wisconsin, with what may have been a Bigfoot-type creature. I don't know why Dogman would be too difficult to believe as we do have video and pics of them in the US which is more than we have to show to convince the Australian public the existance of the Yowie. In fact we do actually have recorded historical evidence of a half man/half dog type creature - the Cynocephali. Marco Polo recorded the dog - headed man on his travels to China. Angamanain is a very large Island. The people are without a king and are Idolaters, and no better than wild beasts. And I assure you all the men of this Island of Angamanain have heads like dogs, and teeth and eyes likewise; in fact, in the face they are all just like big mastiff dogs! They have a quantity of spices; but they are a most cruel generation, and eat everybody that they can catch, if not of their own race. They live on flesh and rice and milk, and have fruits different from any of ours. Now that I have told you about this race of people, as indeed it was highly proper to do in this our book, I will go on to tell you about an Island called Seilan, as you shall hear. I believe that these cynocephaly expanded into Eastern Europe over time hence the legend of the werewolf and that today's Dogman is a devolved species. Apparently Dogman tracks are far easier to find than Bigfoot tracks, demonstrating either apathy or lack of understanding because they track with the nose rather than visually like hominids (us and Bigfoot) do. I think devolved as they now appear more dog/wolf-like than human. Agree with you about Dogman tracks and apathy because unlike Bigfoot they have no real concern about the presence of humans. I believe they are highly intelligent creatures and far more beguiling than Bigfoot or Yowies. Some scientists claim the hominid brain grew larger initially because of bipedalism. It then would make sense a bipedal canid would likewise evolve a larger brain. God knows my own dog is more intelligent than most humans would credit to an animal. Wolves have demonstrated a relatively high level of intelligence as well, so a bipedal canid would be scarily intelligent. Of course, this assumes the Wolf people to be a natural animal. Marco Polo frequently relates tales told to him by fellow travellers and only his personal experiences can be verified (very broadly) in terms of his movements between Asia and Europe and the time during which he was imprisoned, etc. The book itself was written by Rustichello da Pisa based on stories he said Polo told him while the two men were prisoners in Genoa. The stories told are, at best, third-hand. I've always believed, based on what I've read about his Travels that the 'dog headed men' he wrote about were based on exaggerated stories of the lemurs of Madagascar. There were, at one point, lemurs the size of human beings or larger (Archaeoindris fontoynontii), and they existed alongside human beings. They could easily have given rise to this legend. The other issue with Marco Polo's The Travels is that it was re-translated so often; many aspects have been lost, confused or distorted in translation. Using Marco Polo (or Ibn Battuta, or William of Rubruck, or André de Longjumeau, etc) as a reliable source is a dicey proposition; some of what he relates is factually/historically accurate and much of it consists of tall tales he's heard while travelling the world in the company of sailors and mercenaries. [Quote]: Shortly after they moved into their house she conducted a quiet ceremony to invite the local nature spirits into their garden. Soon she and Jerry experienced strong feelings of dread and of being watched. Their screen door rattled, the power box slammed, they heard crashing sounds in the scrub and, in November 1999, heard at seemingly point-blank range, a tremendous, terrifying roar as loud as that of a lion, yet indefinably alien - "other worldly".They then found about 30 huge bite marks up to 7 feet above the ground on young bloodwood trees, identical to those found by Neil Frost whose house, only a couple of kilometres away, is also the focus of Yowie activity.Deep grooves left by upper canines which were consistently 80 mm apart and by lower canines which were always 55 mm apart seemed to prove the bites were all made by the same individual. It was clearly hunting for grubs. At about 2 o'clock one morning in August 2000, Sue woke from a disturbing dream which was accompanied by a weird "electric" feeling, looked up at the window behind their bed and saw a huge animal staring back at her. The creature had a human-sized head which looked disproportionately small as it was set low into a pair of absolutely huge shoulders.As it was illuminated by a streetlight and a full moon, Sue could see the animal had a slim nose, a very wide mouth and a rounded clump of tan-coloured hair on top of its head. [Unquote]. I've read many comments on the Yowie but Ruby's comment in 2005, I think, just blew me away so I'm asking how many on the forum would be receptive to a ''Bush Seance."? If you don't hold any religious views I should think this wouldn't be a problem and I'm confident it would work. I'd disapprove because it would involve supernatural forces but just how many of you would if you really want to meet up with them? Just exclude Dogman for your own health. Simon M wrote: Marco Polo frequently relates tales told to him by fellow travellers and only his personal experiences can be verified (very broadly) in terms of his movements between Asia and Europe and the time during which he was imprisoned, etc. The book itself was written by Rustichello da Pisa based on stories he said Polo told him while the two men were prisoners in Genoa. The stories told are, at best, third-hand. You are right Simon M when you infer that reports get lost in translation but your belief that the 'dog-headed' man is an exaggerated description of the Lemurs of Madagascar is seriously flawed when you consider that Madagascar is nowhere near the reported habitats of the Cynocephali and that these dog/human creatures have been mentioned as far back as 400 B.C. by the Greek physician Ctesias. http://mattsalusbury.blogspot.com.au/20 ... d-men.html - good read. Many reports by many different people on the existence of the Dog-Headed ''people''. Simon M wrote: I've always believed, based on what I've read about his Travels that the 'dog headed men' he wrote about were based on exaggerated stories of the lemurs of Madagascar. There were, at one point, lemurs the size of human beings or larger (Archaeoindris fontoynontii), and they existed alongside human beings. They could easily have given rise to this legend. I would have thought Lemurs may have been mistaken for monkeys more so than large dogs. Consider the fact that the majority of people in 13th Century Europe didn't attend school, nor did they have any system of reference resembling what we would now call scholarship. If you were very wealthy, or in the clergy, you could read and write. If not, you were left to your own devices to survive (or not) as best you could. If people travelled to distant lands, saw things they couldn't explain, and returned with exaggerated stories about these things then all manner of distortions could occur. A 13th Century sailor wouldn't have known the taxonomic difference between a dog and a primate; they both had snouts and fur, etc. If you'd never seen a lemur, you might interpret them as 'dog headed men' when suddenly confronted with one in the jungle, probably fleetingly and with nothing else to go on. There are even more bizarre descriptions of alleged races of people in Marco Polo's Travels, most of which are so confused and unrealistic that they appear to the modern reader to be ridiculous. Many of these stories are plainly untrue and based on fictional accounts; literally 'traveller's tales'. If someone from Europe, with no knowledge of the differences between apes and monkeys and lemurs, but who knew what dogs were, saw a lemur (especially a large one), they might reasonably have described them as 'dog headed' (due to their snouts) and 'men' due to the fact that they had front paws very much like hands, etc. Even if such a person had seen monkeys from Africa and Asia in their travels, a lemur would've looked radically different to anything they would have seen before. Add to this the fact that these stories are being repeated by people with absolutely no education nor any means by which they might obtain one, and confusion is bound to arise.